One hundred years ago, a brief 67-word statement, within a short letter, laid the foundation for the birth of the nation of Israel. Since the sending of that letter, this statement has reverberated down through the corridors of history. There has been no more important brief document in modern Middle East history than the letter written by Lord Balfour, British Foreign Secretary, on behalf of the British government. It has been 100 years since Lord Balfour sent his brief missive to Lord Walter Rothschild II. Rothschild was a British banker, active in the political scene in Britain, a zoologist, and an ardent Zionist. He never enjoyed the financial world and in 1908 left the world of banking to work with animals, his first love. He was instrumental in working with Balfour on the wording of the letter Balfour sent. This letter has become known as The Balfour Declaration. The event that triggered WW I was the assassination of Franz Ferdinand, the archduke of Austria-Hungary by Gavrilo Princip, a Serbian nationalist, on June 28, 1914. One month later the war that would ultimately claim 17 million lives broke out. The warring sides of this conflict were the Allied powers, led by the United States, France, Russia, Great Britain, Japan, and Italy against the Central powers which included Germany, Bulgaria, the Austrian-Hungarian Empire, and the Ottoman Empire. The decision of the Ottoman Empire, pressured by Germany, to join the Central powers paved the way for the Balfour Declaration. The Ottoman Empire’s rule in the Middle East began when the Ottoman sultan, Selim I, captured Cairo in 1517 and ended Mameluke rule in the Middle East. The Ottoman Empire’s rule over the Middle East and Palestine effectively ended in 1916, though formally in 1922, when, in the aftermath of WW I, the Sykes-Picot Agreement was established. WW I would not formally end until Nov, 1918, but by 1916 the Allied victory was inevitable. In May, 1916, the Sykes-Picot Agreement, authored by Sir Mark Sykes and Francois Georges Picot, between Great Britain and France, declared how the lands in the Middle East of the Ottoman Empire would be divided upon the conclusion of WW 1. Both of these countries were given mandates to establish new nation-states in the land mass of the Ottoman Empire. Britain was given the mandate over the area of Palestine, which led to Britain’s declaration in 1917 that a Jewish state/nation be established in Palestine. Four hundred years after the Ottoman Turks started their reign in Palestine, this land was now promised to the Jewish people for a national homeland. It has often been stated that history is His Story! To one committed to an all-knowing, all-powerful, all-present (omniscient, omnipotent, omnipresent) God who created this world and is working out His plan to bring things to a consummation for His glory, it is easy to see God’s hand in the events of history. Especially in the events surrounding Israel, as she is the nation and the people (Jewish people) God has brought into existence to bring His plan to fruition, Romans 9-11. The life of Chaim Weizman is one such providentially placed individual who helped chart the course of “His Story.” Weizman would give “legs” to the Zionist dream of Theodore Herzl. At the first Zionist Congress in Basel, Switzerland, held from August 29-31, 1897, the declared purpose was: “The aim of Zionism is to create for the Jewish people a home in Eretz Israel secured by law.” On September 3rd Herzl made the statement, “Were I to sum up the Basle Congress in a word– which I shall GUARD AGAINST PRONOUNCING PUBLICLY– it would be this: At Basle I founded the Jewish State. If I said this out loud today, I would be answered by universal laughter. 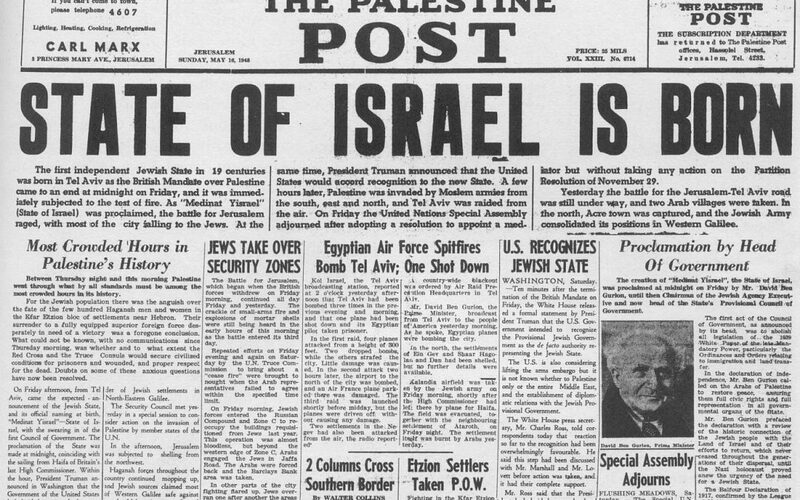 Perhaps in five years, and certainly in fifty, everyone will know it.” It was 50 years later – Nov. 29, 1947 – that the U.N. officially called for the establishment of a Jewish state, Israel, in Resolution 181, in the land of Israel! Coincidental? Only to those who deny the Bible, reject the God of the Bible, and refuse to accept His plan for the world focused around Israel and the Jewish people. Herzl’s statement was prophetic! Weizman would give life to the dream of Herzl. Weizman was born in Russia, 1874-1952, but was trained in chemistry in Switzerland and Germany. In 1905 he moved to England when he was offered a position in the Chemistry Department of the University of Manchester. In England he was elected to the General Zionist Council. The two great loves of his life – Zionism and chemistry – would be wed together, at this opportune time of history, through the providential hand of God. Weizman would invent an acetone that would be instrumental in Britain’s war efforts. Weizman’s invention was a major turning point in the war. Britain wanted to reward Chaim Weizman for his discovery which was a major part of the Allied victory. Weizman wanted no personal reward. He had only one desire – that Britain would do all it could to bring about the Zionist ideal of a homeland for the Jewish people in Israel (at that time referred to as Palestine) – the desire of his heart. The confluence of events and personalities brought together should be evident even to the most hardened sceptic. Minister David Lloyd George was elected one year earlier, December 1916, as the Prime Minister of Britain. The decision to publicly support Zionism was made under his leadership. In little over a month after the release of the Balfour Declaration letter, Jerusalem would be liberated by the British forces. Prime Minister David Lloyd George requested of Allenby that he capture Jerusalem by Christmas of 1917. Allenby more than fulfilled his request. On December 9, the first night of Chanukah that year, Jerusalem would fall to the British army led by Gen. Allenby. Two days earlier British planes flew over Jerusalem dropping leaflets calling for the surrender of the city. The leaflets were signed “Allenby.” The Arabic reading citizenry mistook “Allenby” for “Al-Nebi,” “the Prophet.” To these followers of Islam, “the Prophet” is Mohammed! When Allenby approached Jerusalem 2 days later, he captured the city without a shot being fired. The liberation of Jerusalem coinciding with the first night of Chanukah and the mistaken reading of Al-Nebi for Allenby point to these providential events being used by God to further His plan for Jerusalem and the world. The declaration concluded with, “Placing our trust in the ‘Rock of Israel’, we affix our signatures to this proclamation at this session of the provisional council of state, on the soil of the homeland, in the city of Tel-Aviv, on this Sabbath eve, the 5th day of Iyar, 5708 (14th May,1948).”2 It was signed by David Ben Gurion along with 36 other men and women. God made it clear in His word that He would bring back the Jewish people from world-wide captivity into their own land, Israel, in the last days. Scripture has at least 170 references to the land (of Israel) being God’s eternal, covenantal gift to the Jewish people. The Balfour Declaration of 1917 was the human declaration that God used to set in motion the fulfilment of His promises. “His Story” is nearing completion. The “Rock of Israel” will bring it to pass. Look up, for our redemption draws near! Hallelujah!